“It inherits the wisdom of Minnan Merchants. It assembles numerous elites.” Spoken in perfect English with a dramatic deep voice, these words begin an impressive and instructive video prepared as an advertisement for Peixin Machinery Company and their advanced systems for the paper industry. The link is a secure TinyUrl.com shortcut to www.peixin.com/?mod=video_show&id=17 (used to provide an https connection, required by my site configuration, when peixin.com itself does not support that). There is so much that may be puzzling to native English speakers when they watch this video, and so much that teaches unintended lessons about Chinese business culture. I feel that the video and its Chinese equivalent could be a valuable addition to any course studying Chinese and especially business Chinese or business culture in China. Some of the scenes selected for the video also teach a lot about culture in China. You can see the intense deference to authority in several sections, for example. Quite interesting. But it’s the English that I enjoy most. “Big waves wash the sand, but we still go ahead bravely with the pulse of the times.” That’s one of many intriguing statements that are important in Chinese speeches and ads, but seem really strange to Western ears. The Chinese version of the video has been translated well, I think, as far as direct translations go, but it’s the whole mindset and nature of the content that needs to be retranslated and reworked for this to be an effective video for native English speakers. For example, starting off with a boastful link to Minnan merchants is just crazy–even Americans who have been living in China for years are not likely to appreciate the old lore of Fujian Province merchants known as the Minnan merchants. One of many moments that makes this fun video a great example of the very large cultural gaps that sometimes look like language gaps between the East and the West. No offense intended to Peixin. Their video is better than most and has been done much better than most. The equipment also looks pretty good, but I don’t know one way or the other. On a recent trip to the gargantuan Suzhou Industrial Park, a beautiful region designed with Singapore as inspiration, I went into a popular supermarket, Hao You Duo (好又多), where I saw the strangest Chinglish I’ve seen so far. The store have numerous large posters hanging over the escalator ramps and other regions to celebrate the Chinese New Year and the Year of the Horse. The Chinese just says “wish you a great new year” and “lucky year of the horse.” Whoever entered the English translation was the laziest typist of all time. Looks like he or she set one hand down on the keyboard and just wiggled their fingers a few times on the same keys, over and over. Finished. 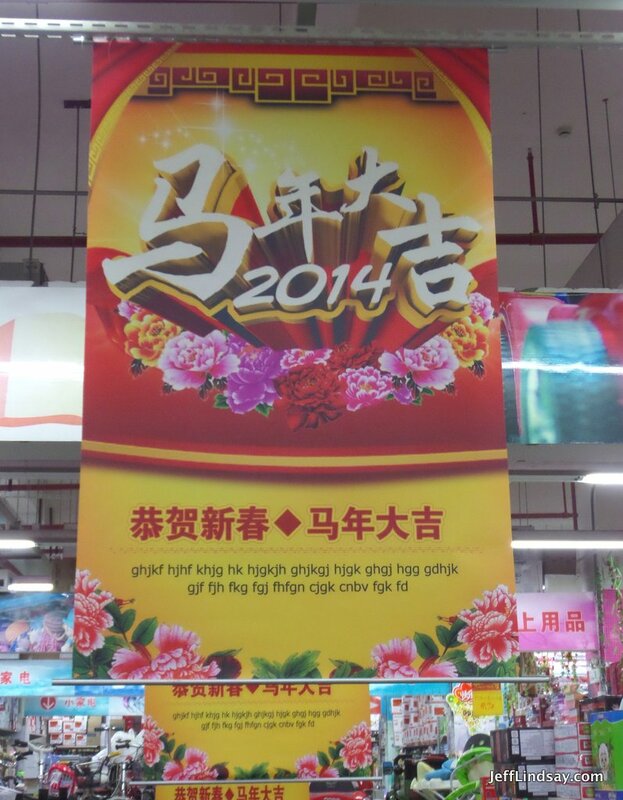 What amazes me is that this large supermarket chain spent a lot of money to produce these beautiful posters and then print, distribute, and hang hundreds of them (I presume these are all over their stores across China)–all without bothering to ask anyone with any English skills at all if the English was OK. In fact, every educated person in China at least understands the alphabet in order to use pinyin for typing email, and anyone who understands the alphabet ought to know that words generally need some kind of vowel, don’t they? No one noticed. No one cared. 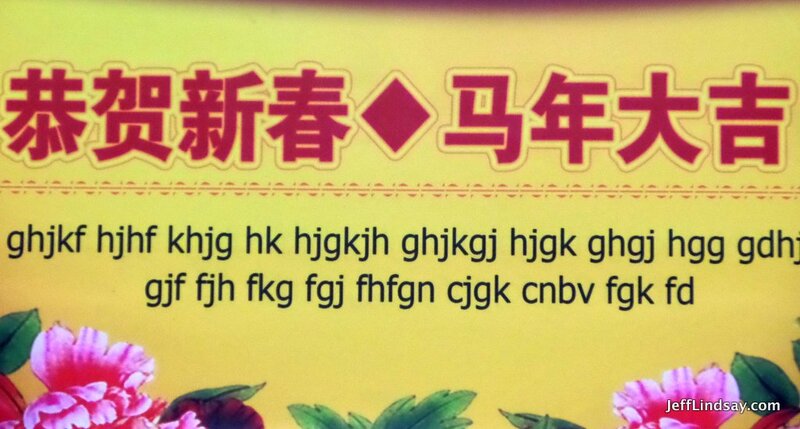 That is the secret to China’s most entertaining Chinglish.